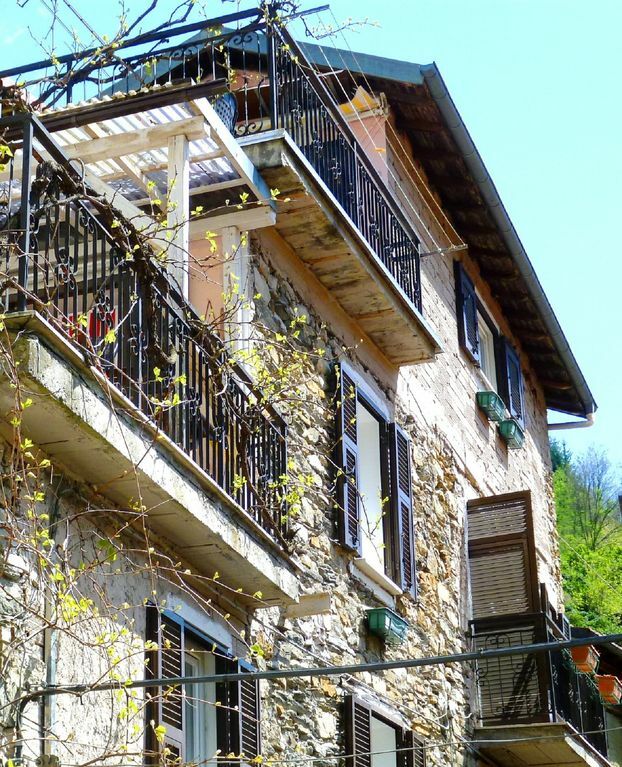 Casa Bechteler in Molini di Trioa is a südexponiertes stone house in quiet location on a slope (2 West and 1 Ostdachterrasse and small balcony). The house has a well-equipped kitchen (eg. B. Dishwasher, coffee and espresso machine, food processor, toaster, large fridge freezer, gas stove, oven, washing machine). In the living room there is satellite TV, books, stereo with CD, stove, etc .. Within 1 - 2 minutes you are in restaurants, grocery stores, pharmacy, bars, in the wild, at the bus stop. 2 playgrounds can be reached on foot in a few minutes. One of the children's playgrounds, the river was at a bathing place dammed (clean mountain water). In the autumn (up to approx Mid October) there nothing sweet grapes on the house. Directly from the house wonderful walks are possible, eg. B. - To 300 m higher Triora (old city in a panoramic position with its historic building stock and ethnographic museum). -after Corte (circular route through woods, along the river and also by terraced landscape). In the hinterland of Molini di Triora are several z. T. unpaved and closed to general traffic-pass roads, which are ideal for mountain biking. From Molini di Triora, one can also make very nice excursions and mountain tours. -Monte Ceppo (1627 m) reachable through the comprehensive passport Colla Langan, from the parking slight increase (about 1 hour) and a phenomenal view over the sea and the Maritime Alps. -Monte Saccarello (highest with 2200m Ligurian mountain) is climbed from Verdeggia and is only something for the experienced (approx. 3 hours). -Künstlerdorf Bussana Vecchia (between Taggia and Bussana exit Arma di right). Palm Trees and flower gardens and old town of Sanremo. The free local Mediterranean beach in Taggia (24 km) is gently sloping and therefore also recommended for children. You can swim from mid / late May to early October. Nature in the Argentina valley offers an almost unique variety. From the palm trees and agaves on the Mediterranean maquis on, the olive groves, the deciduous forests with chestnuts, etc. to the larch and spruce the higher altitudes there are not even 30 km away. On Mount Saccarello you can observe marmots in alpine rose fields. At the Passo di Teglia, a recommended scenic road from Molini di Triora, look for. B. wild lavender. In the bath there is a typical small tub. It is equipped with a shower curtain, so it is also used as a shower. An extra shower does not exist. The house can accommodate 5 people (upon request to 7 pers.). Couple get a discount (see rates). The layout and equipment is as follows: *** Ground floor: bathroom with tub and bidet, double bedroom, hall with sofa bed, staircase with narrow spiral staircase to the first Floor. *** First floor: bedroom with double bed and balcony, bedroom with double sofa-bed and access to a partly covered west terrace. *** Second Floor: From the East Terrace accessible living space with well equipped kitchen (also dishwasher) dining table, sofa and West Terrace. *** Features: Gas central heating, satellite TV, stereo, books, deck chairs, hammocks, washing machine, iron and ironing board, barbecue, fireplace, 2 older bikes, cot and high chair, all the windows to the south. *** Extra Treat: mid-September to mid-October, the white, sweet, unsprayed grapes at the house are mature. Eat as much as you want. Casa Bechteler is a quirky and unusual rustic house, situated in the charming village of Molini di Triora, and containing all mod cons. The house is typically rustic and very comfortable. The instructions within are very thorough, but in German, so you may want to use Google Translate if you are an English guest. A highly enjoyable stay. Der Aufenthalt war sehr schön. Die Wohnung ist sehr gut ausgestattet. Petite maison très sympathique, très bien équipée, paysage somptueux, ensemble très sympathique ! Molini di Triora ist ein netter kleiner Ort im Hinterland von Taggia. Am Ort vorhanden sind mehrere kleine Läden, die alles für den täglichen Bedarf bieten. Schön war die Bademöglichkeit im örtlichen "Freibad", für dass der Fluss in einem kleinen Staubecken aufgestaut wurde. Das Ferienhaus bietet ausreichend Platz für 6 Personen, 7 wird grenzwertig. Küche und Wohnzimmer sind großzügig ausgestattet. Für ältere und größere Personen dürfte die enge Wendeltreppe zwischen EG und 1OG etwas problematisch sein. Ausflugstipp: Der Monte Ceppo bietet eine herrliche Aussicht auf Meer und Berge. Wir waren zunächst in Molini und anschließend in Argallo. Tolle Kombination. In Molini fanden wir ein zentral und doch ruhig gelegenes kleines Häuschen vor, das sehr sympathisch urig italienisch zu nennen ist. Originell, unkonventionell und liebenswert. Die Dachterrasse ist herrlich. Blick ins Tal und ins typisch ligurische Dorf. Gebadet haben wir in einem kleinen Stausee am Ortsrand von Molini. Klasse. Das Dorf ist ursprünglich. Wo findet man noch einen Espresso für einen Euro? Bemerkenswert der Ausflug in die Berge und in die Hexenstadt Triora mit exzellentem Restaurant. Für Italienfreunde der traditionellen Art ein kleines Juwel zu einem sehr fairen Preis. "Tolles Haus, nettes Dorf, freundliche Besitzer"
wir das Haus für nächsten Sommer wieder gemietet haben. The historical site Molini di Triora is centrally located on the river Argentina, which flows into the Mediterranean Sea near San Remo is 24 km away at the seaside resort Taggia. The surrounding mountains and the mountains (up to 2000 m) offer an abundance of hiking and mountain biking opportunities. From the terraces of our house overlooks the city and enjoying the view of the mountains around. Traffic does not take place at the house, because it is only accessible by a narrow road (parking depending Park Situation 1 - 5 mins from the house). Nevertheless, enjoy the convenience of a local area with good restaurants, all day (including Sundays) open shop (2 minutes), bakery etc. Families appreciate the 5 minutes away Playground at the confluence of several mountain streams mi t nice swimming spot. Molini di Triora itself is achieved through the well-developed road through the Argentina Valley. The bus stop is located just 2 minutes from the house (bus connections at longer intervals after Taggia, before there rail link). Der Preis gilt für 4 Personen. Bei weniger Personen -4 € pro Person (Preisreduktion nicht bei Onlinebuchung, sondern nur bei direkter Buchung bei mir) , bei mehr Personen +4 € pro Person Weitere Nebenkosten als die als Zusatzgebühr ausgewiesene Endreinigung fallen nicht an.